Here is a very easy DIY FM receiver circuit diagram. 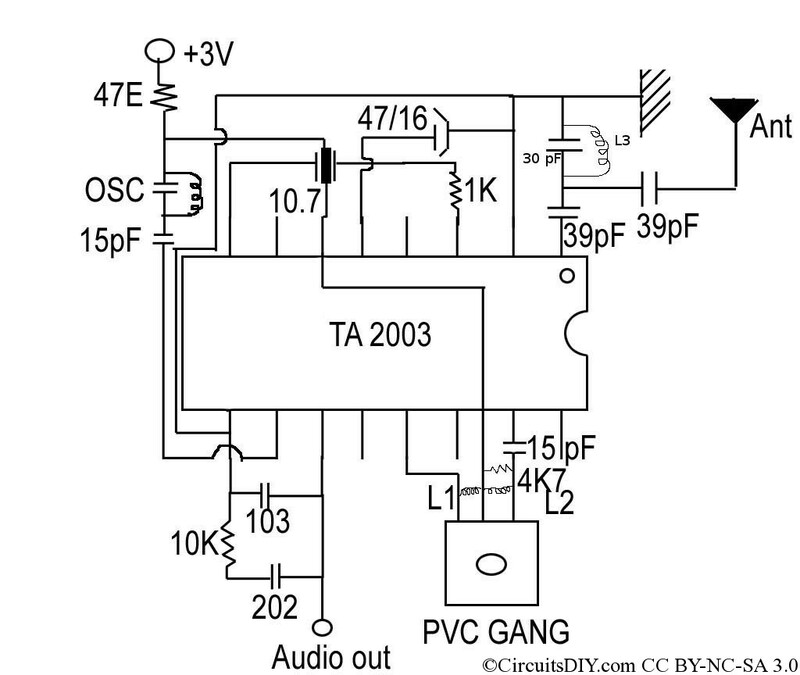 It is easy to build FM receiver circuit as the TA2003 IC used here, comes in easy DIP package. It’s both Am and FM receiver IC, we’ll use FM, so FM circuit is only given. All the parts name is given in the diagram, click for a better view. The L1, L2 and L3 coils are to made by hand. Take a 5mm diameter ferrite core, or other thing, to roll 22SWG copper wire to make those coils. Use a general purpose 500pF gang for tuning. Make the connections of the GANG, coils as short as possible. The audio output should be fed to any amplifier for amplified sound output. The main advantage of this circuit is that it requires much less current, and operates at 3V. It could be used to check DIY FM transmitter circuits easily. Leave your comments below, your feedback is important. Only available in Alibaba. com , china !! 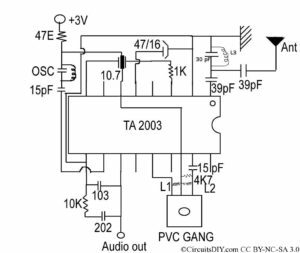 Hi, thank you for this small voltage device, please is there any kind of FM circuit which does not have that white noise, cos i want to make a kind of microphone transmitter receiver circuit. Use this for the transmitter, https://www.circuitsdiy.com/the-simplest-tv-transmitter-ever-made/ . You need to lower the frequency to use in FM band, 88-108 MHz. It’s one of the best white noise less transmitter I’ve ever used. Thank you very much, do you also have a receiver circuit?